Along the Gui-kun Railway, 97 km from Guiyang, AnShnn city may be called "The hinterland of Qian and the throat of Dian (Yunnan province)". It is the central city along the west tourism route. Early in the Warring States period (403-221 BC), it was the state of Yelang King and changed to Anshan Prefecture in the Ming Dynasty. In 1958, a municipality government was set up there. Anshun is rich in tea. Its traditional craft of wax printing has a history of more than 2000 years. One hundred li around Anshun are scenic spots ofYellow FruitTrec, Dragon Palace, Zhijing Cavern, Baili Azalea. Maling River, etc. Approximately 60 km south to Anshun City and 137 km from Guiyang, the Yellow Fruit Tree waterfall has a height of 74 m and a width of 81 m with a drop in elevation of more than 20 m. The water flows down to the Rhinoceros Pool, presenting a magnificent view. 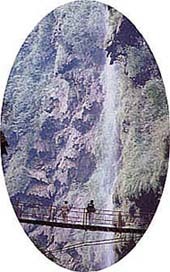 Around the Yellow Fruit Tree waterfall are the Steep Slope Pool and more than 10 waterfalls constituting a large waterfall group. The waterfalls, which were formed within the karst region in subtropical lone, are named as "Karst Waterfall". ground wind tunnel which can be toured by boat. Tianxing Bridge, 6 km from the Yellow Fruit Tree Waterfall, involves Tianxing potted landscape, Tianxing Cave Scenery and Rock Forests, and merges grotesque mountains, rocks, solution caves and waters into a whole. Zhijing Cavernm also named Daji Cavern, involves 11 scenic districts, 47 halls and shrines and more than 150 beauty spots with magnificent scale, matchless attractions and imposing manners. In the cavern there are numerous stone pillars, stalagmites, stone curtains and stone flowers, etc. with grotesque shapes, forming a natural karst museum. Located to the southern end of Liupanshui city, Suojia Ecology Museum is the first of this kind in China. It lies in a commune district embraced by mountains. 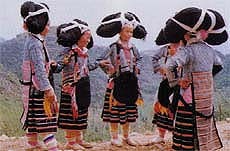 Inside the commune inhabit some ethnic people with long angles as their hair dress. More than 4000 peole are distributed in 12 stockades. They preserve a rather old and simple tradition, such as the living mode with the men plowing and the women weaving, rich marriage and funeral protocol, music and dance with unique style, beautiful embroidery and wax printing. neck cranes. It is a national natural reserve. colored and lush flowers are everywhere, so called "Baili (hundred li )Azalea". Maling River, also called Qinshui River or Mabai River., flows through Maling district, Xinyi county, southwestern Qian;hence the name "haling". It has deep and solitary riverbed with overhanging precipices and steep cliffs on each bank. The river has a high drop in elevation and numerous waterfalls, some of which are as high as a hundred metres, flowingdown with imposing manner and splendid sightseeing.